Ron and Jane Graham made a gift of $4 million to support the construction of two basketball practice courts at Merlis Belsher Place (Photo: Dave Stobbe). Ron and Jane Graham know a good opportunity when they see one. When they heard that the University of Saskatchewan (U of S) was proceeding on a new ice facility to replace the aging Rutherford Rink, they decided to get involved to fix a long-standing issue that they said also put the Huskie basketball teams at a disadvantage. The basketball teams practice in the Physical Activity Complex (PAC), but are unable to use the facilities every December and April when the space is transformed into an exam room for finals. Ron said that reduction in practice time has a real impact on the athletes, who train 12 months a year. "It's a year-round commitment," he said, noting that the exam scheduling also leads to other hurdles. "It's difficult for the university to attract tournaments, because the demands on the PAC are significant." With many other Canadian universities offering more practice facilities for their athletes, the Grahams have now committed $4 million to the U of S to further develop the new ice facility—Merlis Belsher Place—into a multi-sport complex. Their major gift will allow for the addition of two practice gymnasiums, dressing rooms and team rooms for Huskie basketball. Additionally, the new courts will be NBA length, "a full 94 feet—longer than collegiate courts in the city," he said. The new space also gives the university flexibility to consider an athletic injury research area for athletes down the road, which is on the Grahams' wish list for the basketball teams. Huskie men's basketball coach Barry Rawlyk said the Grahams have been instrumental to the teams, and that their commitment to the new facility will lead to improved player development. "This is a true game changer," he noted. "Access to a facility such as this will greatly enhance the student-athlete experience for every member of our team and will further enhance our ability to attract top-level talent to the University of Saskatchewan." The university announced the donation to the new facility as part of a special recognition event for the Grahams on December 8, with university students and staff, Huskie athletes and Saskatoon community members in attendance. The event also celebrated a major milestone—the Grahams have now donated close to $20 million in their lifetime to support the university and its students, which is the largest cumulative gift from alumni in university history. In recognition of that remarkable support, the university announced that the main court in the PAC will be named Ron and Jane Graham Centre Court. 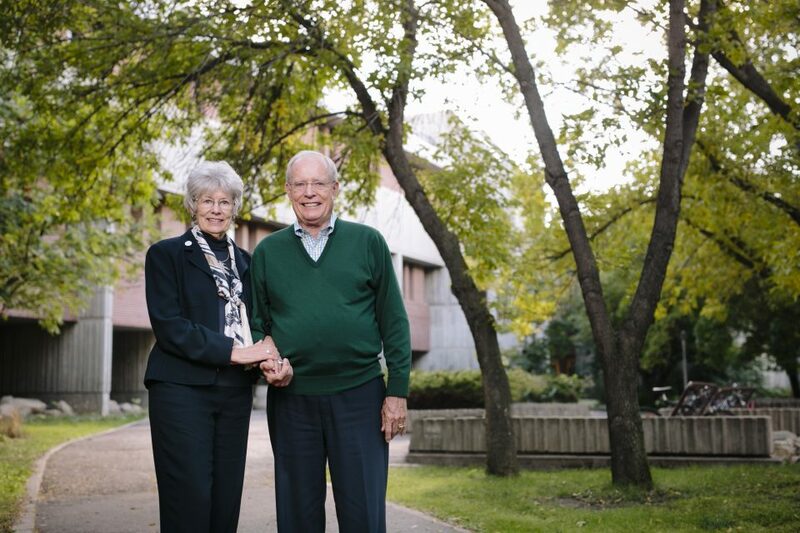 "We are privileged to have the support of Ron and Jane Graham, who are shining examples of what it means to be passionate University of Saskatchewan alumni," said U of S President Peter Stoicheff. "Their generosity is evident across campus, having contributed to numerous athletic initiatives, academic programs, and student scholarships. Simply put, they are outstanding supporters who have made a positive impact on our campus for our entire community." The Grahams have been proud Huskie supporters for decades because athletics played a positive role in their university experiences. When they studied at the U of S—Ron (BE'62, DCL'13) and Jane (BEd'63) —Ron was a quarterback for the Huskie football team while Jane was actively involved in intramurals, playing every sport offered. In 2010, this passion for supporting athletics led to a new visitors' facility for Huskie football. "We had done a walkthrough of the old facility, and you could see the sky through the holes in the ceiling," said Ron, who described the need to get involved with the re-design of the clubhouse. The Grahams donated nearly $3 million towards the two-storey expansion of the modern Graham Huskie Clubhouse at Griffiths Stadium, providing Huskie Athletics with a much-needed training room, film room and meeting space that helps give the team an advantage. An architectural drawing of the Ron and Jane Graham Gymnasium. The Grahams have also made a major impact on the university's basketball teams. After their trip to watch the women's team compete at the national championship in 2015, Ron noted opposing teams had more fulsome coaching complements. After that competition, he and Jane decided to fund assistant coaches for the two Huskie basketball teams for five years. The competition was a memorable one for Ron and Jane, and showed the Huskies just how dedicated the couple is to the teams. The Grahams flew from their home in La Quinta, Calif., and then in-between the competition's two host cities—Toronto and Quebec City—throughout the competition weekend, so that they could see both the Huskie men's and women's teams compete. "We had hotels in both cities because we didn't know who would advance (to the medal round). At the end of it we were more tired than the players!" said Ron with a laugh. $3.27 million to enhance the centre. The Ron and Jane Graham School of Professional Development helps engineering, agriculture and bioresources, and kinesiology students develop professional communication and entrepreneurial skills so that they are better prepared to enter the job market and to become better citizens after graduation. A conceptual design of Ron and Jane Graham Centre Court. "That is the most memorable and long-lasting gift we've made," said Ron, who comes from a family that includes three generations of U of S engineering alumni. Ron also noted that this gift in particular brought together the couple's vocational interests. "It seemed to fit with Jane's education background and my engineering background, so we focused on giving there," he said. Not only have the Grahams made a positive impact on the U of S community and campus, they've also left a lasting impression on the parents of many Huskie athletes. "We often hear from parents of students who have benefited while at sporting events—they even express their gratitude to our family members," Ron said. When asked what inspires them to give back to their alma mater, the Grahams spoke of supporting areas that are close to their hearts. They hope other alumni do the same, in their own way. "We look at people to give back to where they are passionate," Ron said. "We hope it's at their university, as it sets the direction of their careers." Based on the turnout for the donation announcement event, the Grahams' passion for supporting the university, its students and its athletes is appreciated by many across campus.